I noticed that within Affinity Designer I can't add a negative value to the 'First Line Indent' field under the Paragraph tab. It would be very helpful if I could. Adobe Illustrator allows this. Wait! Not to sound dumb but does "+1" mean a vote for this feature? You got it! I expect to see hanging indents in Affinity Publisher, but I'd love to see them in Designer as well. You can do hanging indents now. Set the left indent to 1cm, and the first line indent to 0cm, in that order. A negative first line indent would nominally go outside of the frame. We don't allow that and I'm not sure why you'd want it. If you do what I just wrote and then change the left indent back to 0cm, the first line indent will update and display as -1cm, but actually draw as 0, inside the frame. Sometimes it is easier to indent a row out of text frame than order whole frame structure to support hanging indent looklike. Also, it would nice if you could kern type out of frame, Same effect but done manually. In Indy this is done by inserting a space in front of first character and kerning left (option-arrowleft). Very useful especially when drop cap looks to be too "in" due glyph space. Dave Harris, yes I know about the method you suggest. It's just that instead of being able to click the down arrow in the 'First Line Indent' and incrementally set a negative value till the text moves to where I want it, I have to go back and forth between two fields ('First Line Indent' and 'Left Indent') to get those results. It's not as intuitive or convenient, but I can see your logic about not going outside of the text frame. I guess it is because I am use to doing it in Adobe Illustrator. Why do you have to go back and forth between two fields? If you want a first line 'outdent' (i.e. hanging indent) of 1.5 cm, you just set the left indent to 1.5 cm and then set the first line indent to 0 cm, exactly as Dave Harris described. It is not a problem. It is just an extra step that wasn't as immediately obvious to me. I see, thanks. I've never used Illy, so I have no preconceptions about how this kind of thing should work! It is a common design to at least place certain elements outside the text frame, at least in a layout application. For instance, in this magazine I do, the requirements are for hanging punctuation (the quote marks) to, well, hang. This makes sense from a layout application perspective and would hope A.Publisher would allow hanging outside the text frame. Why? Because then the text frames all line up with guides (in this case, column guides). 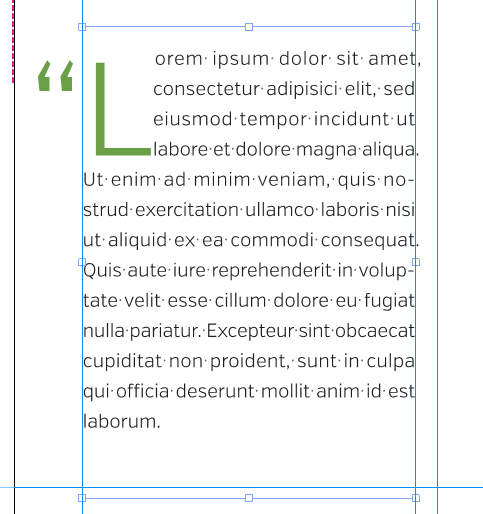 This makes for consistency for the frame widths and hence text column widths without fiddling around. MikeW I never thought about the whole guide thing. That would make sense. Also, if you want to do distribution this would be helpful as well. I totally agree with MikeW and wrinkledlight. In my opinion, a negative indent is an exception to the rule and should not have consequences to the way the designer constructs a grid system (columns, positioning text-frames etc.) Another use for negative indents are numbered and bulleted lists. Lack of this functionality is a major cause of frustration in Adobe InDesign and would be a great selling point for Affinity. This is definitely a regularly used feature for me, especially for bulleted lists as mentioned above. To adjust the entire text frame just to have an exception seems like a clunky workaround to me.